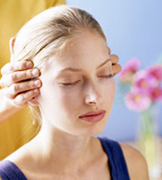 Acupuncture is the practice of restoring balance to the body’s energy(qi) through the meridian system. Pain and illness results when there is an imbalance or blockage of qi within the the meridians of the body. Fine painless needles are inserted into specific points in attempt to release, restore and encourage qi to flow smoothly and hence relieve pain and disease. Acupuncture can be used to treat almost any symptom or condition. It can help alleviate pain from sore or injured muscles and joints, arthritis and headaches aswell as manage problems like sinus, asthma and menstrual issues. Acupuncture is also highly effective in the management of emotional health, helping with depression, anxiety and stress. Sally is a Traditional Chinese Acupuncturist who works with 5 element theory and Traditional Chinese Philosophy that is in line with code and practice of the universities and hospitals of China. A consult and treatment with Sally is always personalized to suit individual patient needs. She often combines acupuncture and massage to relieve musculoskeletal ailments(such as back, shoulder, neck pain), and Acupuncture and energy work are often combined for more internal or emotional conditions. Sally’s style of massage is focused on remedial, thorough and often deep muscle work that also involves acupressure points. Certain points in the muscles are pressed with finger, thumb or elbow pressure, for a short period of time to encourage qi flow and relieve pain and soreness. Acupressure Massage is most often combined together with acupuncture in Sallys treaments as she obtains her best healing results and pain relief with this method. As a trained Doula, Sally has care and knowledge in supporting and assisting women during their pregnancy and labour. Sally offers education on the natural birthing process and information and techniques that enable women to be empowered, confident and relaxed toward their birthing experience. Acupuncture and massage treatments can also be included in Doula sessions. These can not only help manage morning sickness, heartburn, oedema, hip and backache and induction of labour but also provide an invaluable gift of nurturance and pampering during this precious time in a woman’s life. Kinergetics is a form of kinesiology based on retrieving knowledge from the body via muscle testing. Through Kinergetics, Sally is able to access vital information stored within the body that may be the underlying contributer of stubborn physical and/or emotional issues. Kinergetics can then help to correct energy imbalances relating to the problem. Kinergetics is the perfect treatment tool for anyone wanting answers to health problems and in clearing the blocks to continued health and well being. Sally also offers a needle free acupuncture treatment through Laser application. Acupuncture points are stimulated via red laser or infra-red laser on the skin for a minute at a time per point. This treatment is safe and non invasive and is available for those shy of needling. It is also a fantastic tool for the treatment of children’s pain or health issues. Sally is also trained in Cupping which is an ancient Chinese therapy in which a cup is applied to the skin and the pressure in the cup is reduced (either by heat or suction) in order to draw and hold skin and superficial muscles inside the cup. Sometimes, while the suction is active, the cup is moved, causing the skin and muscle to be pulled. This is called gliding cupping. Cupping is applied to certain acupuncture points as well as to parts of the body that have been affected by pain, where the pain is deeper than the tissues to be pulled. Cups are generally left in place for ten minutes although the time can range from five to fifteen minutes. The skin will redden due to the congestion of blood flow. The cup is removed from the skin by pressing the skin on one side, allowing some outside air to enter and thus equalise the pressure. Some bruising on the skin where the rim of the cup is to be expected. Cupping can affect the body up to four inches into the tissues, causing the tissues to release toxins, activate the lymphatic system, clear colon blockages, activate and clear the veins, arteries and capillaries, activate the skin, clear stretch marks and pull and release the fascia of tight sore muscles. Cupping with Sally may include Acupuncture or Chinese Reflexology.